Chinmaya Mission Melbourne was established in 1981. It is now a vibrant centre with a property of its own. The centre was acquired towardes the end of 1998. 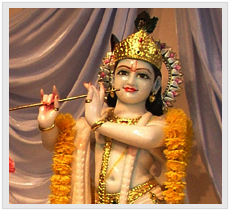 In Janmashtami of 2001 the idol of Lord Krishna Gopala Krishna Kanhaiya was installed. Sculpted in white marble, Lord Krishna has a most enchanting smile. With his music he enthrals all devotees and pulls them to Chinmaya Dham.